He changed out 3 bathroom sink faucets (all new ones installed), one kitchen sink faucet, changed one outdoor electrical outlet, and installed new rubber stripping on the bottom of the garage door. 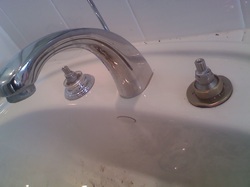 He was punctual and efficient; I called him back after the installations to tell him one sink was leaking underneath, and he immediately returned and fixed it without complaint. He was friendly and prompt. I requested he install a portable air conditioner in the garage unit we used for a gym. We also had four or five other minor items we needed to fix such as a leaking water hose outlet, leaks in our irrigation system and installation of a light fixture in the master bedroom. The service provided was excellent especially since we had to increase the size of the portable unit to reach the temperature I wanted. He suggested we install some insulation and a door to seal off the gym from another part of the garage and this was the correct approach. He handled the return of the first unit without an issue and did a lot of work to find the best way to vent the portable unit. The work was very professional and I'm quite pleased. Installed shower stall door, squeegee on bottom of shower stall door in another bathroom, and replaced vanity and mirror. Rob showed up, we walked through everything, he gave me an estimate and as soon as the materials arrived he went to work. Finished in a day, very prompt, very professional.